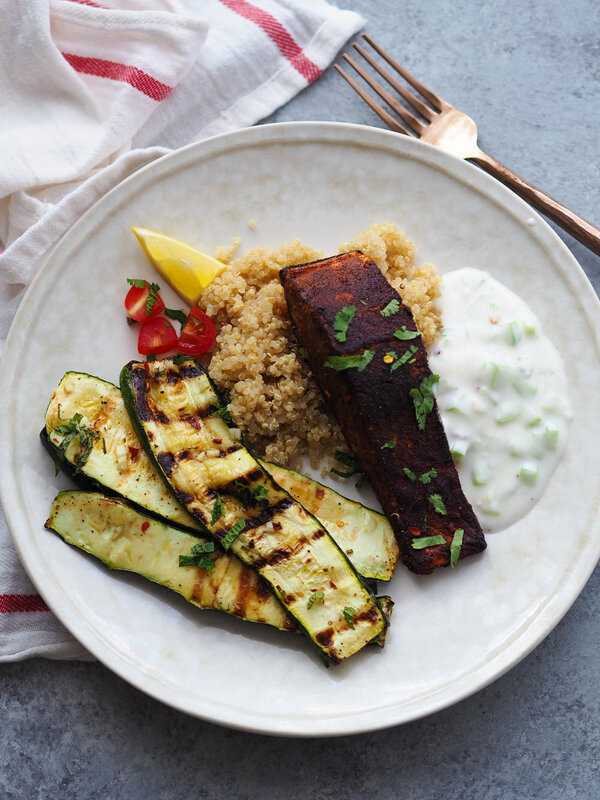 Tandoori salmon with cucumber yogurt sauce is a simple but flavorful weeknight meal! 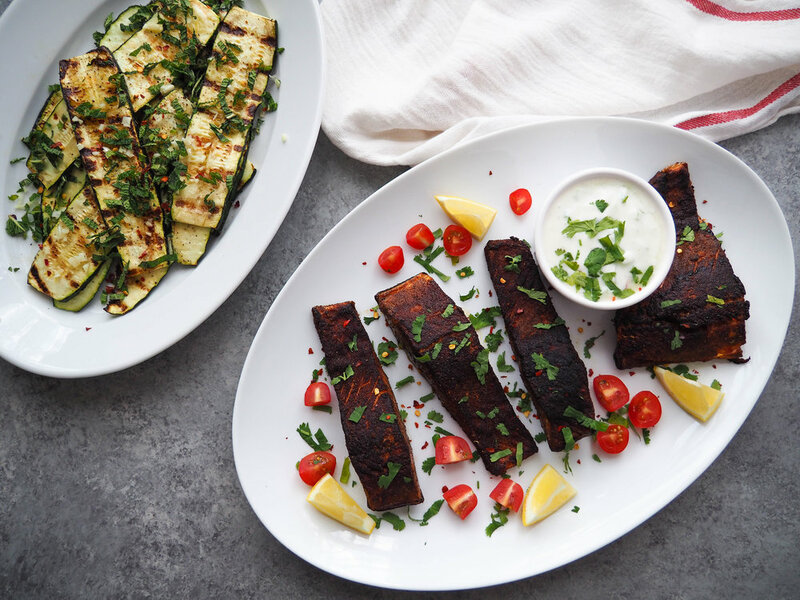 Serve with quinoa or rice and grilled zucchini for a complete meal! Takes less than 30 minutes to cook! 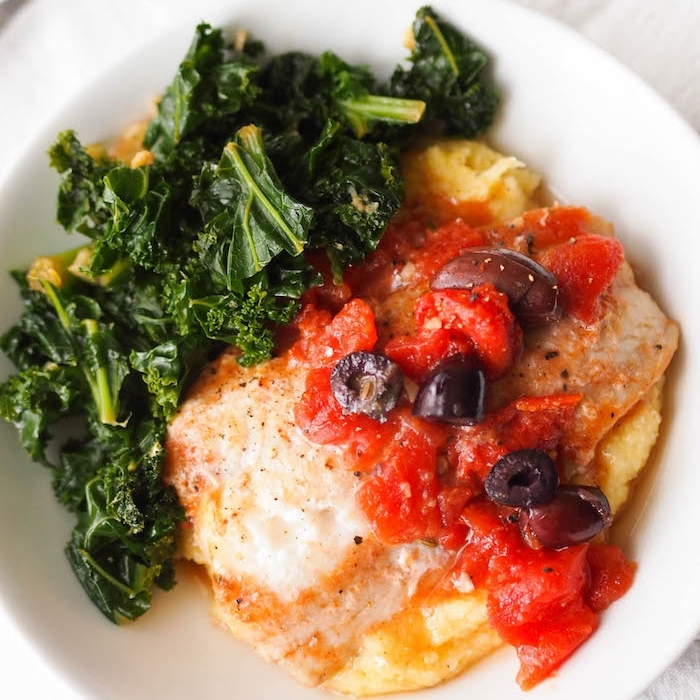 This recipe was originally posted October 2013. Recipe, images and and text have been updated. The first time I ever had tandoori chicken was in of all random places, the Bahamas. I went when I was in middle school with family, and while exploring the island, we stumbled across a tiny little Indian restaurant with the BEST food. I was one of my first times trying Indian food, and I was hooked. Now, to make legit tandoori, you technically need a tandoor oven, which doesn't seem like a reasonable purchase at this point in my life. 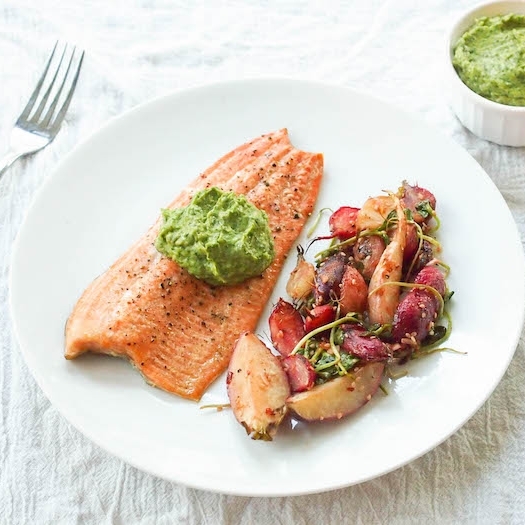 But you can replicate some of the flavors with tandoori spices, which you can find at well stocked grocery stores, Indian markets, or order online. Having lots of fun condiments and spices on hand makes simple cooking so easy. 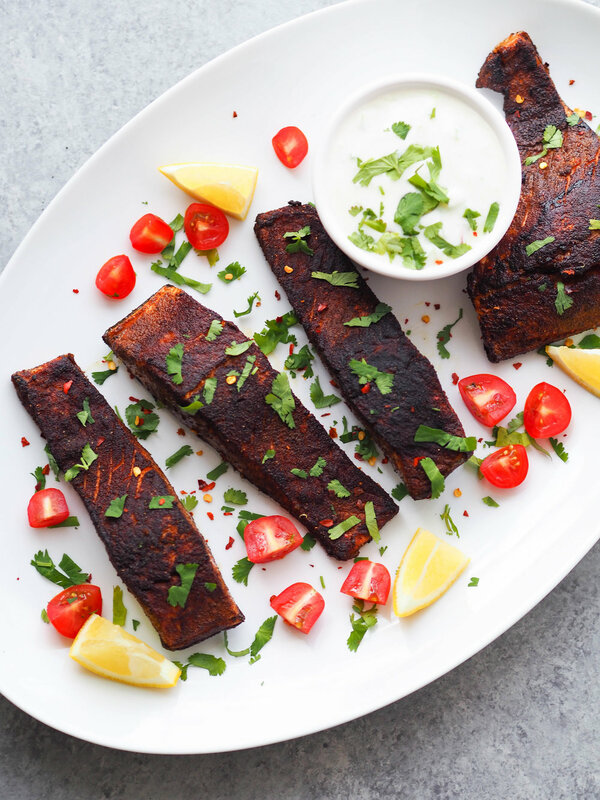 To make this tandoori salmon, I just rubbed it with tandoori spice and seared it in the skillet. So easy! And the cucumber yogurt sauce takes no time at all too! You could also cook this salmon on the grill, which I would have done but we were out of propane. Just start skin side down then flip after a few minutes. I think the smoky flavor would make this spicy dish even better. Whisk together dressing ingredients in a medium bowl. Season with salt to taste. 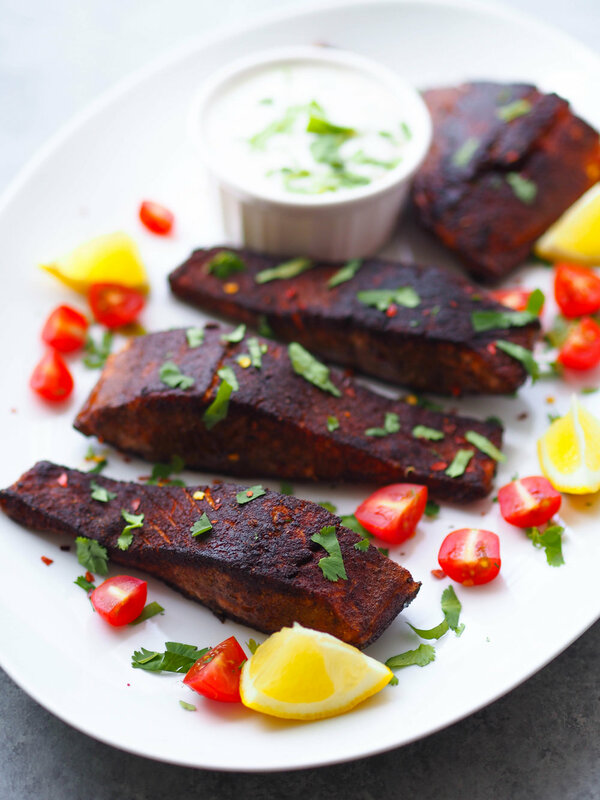 Rub the salmon with tandoori spice on all sides. Season with salt and pepper. Heat about 1 tablespoon of oil in a large skillet on medium-high heat. Add salmon, skin side up to the skillet. Cook for about 4 minutes. Flip and cook about 2 minutes until cooked through. Transfer to a serving dish.